Google Assistant on iOS has just received a new feature that will help people keep a track of all their reservations from within the standalone app. The feature, which is appropriately named ‘Reservations’, was first spotted last month within version 7.26 of the standalone app. The information about your reservations is automatically collected from Gmail and in the case of flights it lists down the airline, flight number, destination, and dates. Users can also tap on an individual reservation to get more details about it, allowing users to see how the reservation was generated and opening the email that particular reservation originated from. 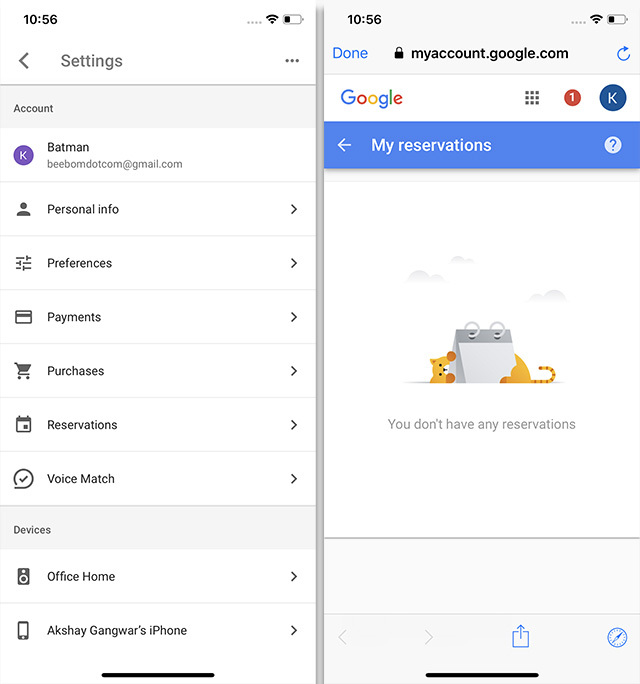 It’s worth noting that the reservations option isn’t available on Google Assistant for Android and this isn’t the first time Google has rolled out a new feature to the iOS version of the app, before pushing it to the Android release. For instance, Google removed the ‘Your Stuff’ tab from the iOS version of the app back in March, but the option has just started disappearing from Android devices last week. While the option may not be available on Android yet, Google is likely to start rolling out the new feature to the Android version of the app quite soon. It’s also quite possible that Google may implement the feature in a completely different manner on Android, as the company has previously taken this route for other features. For example, purchases made on iOS opens up the My Account page in a browser, while on Android the entire ordeal is a native in-app experience.